To say that walnuts are a nutritious food is a bit of an understatement. Walnuts provide healthy fats, fiber, vitamins and minerals — and that’s just the beginning of how they may support your health. In fact, there’s so much interest in this one nut that for the past 50 years, scientists and industry experts have gathered annually at the University of California, Davis, for a walnut conference discussing the latest walnut health research. The most common variety of walnut is the English walnut, which is also the most studied type. Here are 13 science-based health benefits of walnuts. Walnuts have higher antioxidant activity than any other common nut. This activity comes from vitamin E, melatonin and plant compounds called polyphenols, which are particularly high in the papery skin of walnuts . A preliminary, small study in healthy adults showed that eating a walnut-rich meal prevented oxidative damage of “bad” LDL cholesterol after eating, whereas a refined-fat meal didn’t . That’s beneficial because oxidized LDL is prone to build up in your arteries, causing atherosclerosis . 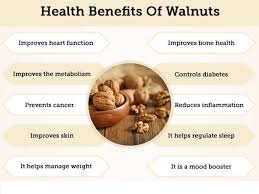 Walnuts are significantly higher in omega-3 fat than any other nut, providing 2.5 grams per 1-ounce (28-gram) serving . Omega-3 fat from plants, including walnuts, is called alpha-linolenic acid (ALA). It’s an essential fat, meaning you have to get it from your diet. According to the Institute of Medicine, adequate intake of ALA is 1.6 and 1.1. grams per day for men and women respectively. A single serving of walnuts meets that guideline . Observational studies have shown that each gram of ALA you eat per day lowers your risk of dying from heart disease by 10% . Inflammation is at the root of many diseases, including heart disease, type 2 diabetes, Alzheimer’s disease and cancer, and can be caused by oxidative stress. The polyphenols in walnuts can help fight this oxidative stress and inflammation. A subgroup of polyphenols called ellagitannins may be especially involved. Beneficial bacteria in your gut convert ellagitannins to compounds called urolithins, which have been found to protect against inflammation . Studies suggest that if your gut is rich in health-promoting bacteria and other microbes (your gut microbiota), you’re more likely to have a healthy gut and good overall health. An unhealthy composition of your microbiota can contribute to inflammation and disease in your gut and elsewhere in your body, increasing your risk of obesity, heart disease and cancer. What you eat can significantly influence the makeup of your microbiota. Eating walnuts may be one way to support the health of your microbiota and your gut. When 194 healthy adults ate 1.5 ounces (43 grams) of walnuts every day for eight weeks, they had an increase in beneficial, probiotic bacteria, compared to a period of not eating walnuts . This included an increase in bacteria that produce butyrate, a fat that nourishes your gut and promotes gut health .